In a deeply unequal society, the affluent will always sneer at public services and the men and women who provide them. 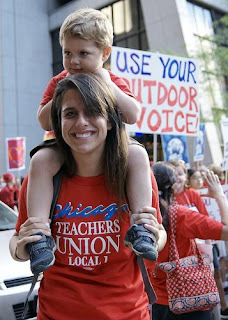 Last year, state lawmakers in Illinois did their best to make a Chicago teacher strike impossible. They passed a new law that required at least 75 percent of the city's teachers to OK any walkout in advance. How did Chicago teachers respond? In advance balloting, 92 percent of the city's teachers voted, and 98 percent of those voted to strike if contract negotiations broke down. This near-total teacher support for the walkout, which began September 10, shows just how intensely frustrated Chicago teachers have become. They've been teaching for years in schools woefully ill-equipped to serve the city's students. The vast majority of these students, 87 percent, are "low income." Many have no books in their homes and no quiet place to study. Some — more than 15,000 — have no homes at all. Yet Chicago's political officials haven't done nearly enough to help teachers help these students learn. Over 160 Chicago schools have no library. To help homeless and other children in unstable family situations, the 350,000-student Chicago schools have only 370 social workers. Teachers have consistently called for more resources. But Chicago school officials have bought into a reform agenda that dismisses concerns about inadequate student support. Schools don't need better resources. They need, proclaim Chicago's self-styled reformers, better teachers. This "reform" agenda pushes endless standardized testing to identify "low-performing" schools. For more than a decade now, Chicago officials have beenclosing down schools they deem as "failing" and replacing them with privately run charter schools. The Chicago school chief who initially led this charter surge now serves as the U.S. secretary of education, and Arne Duncan's test-heavy approach has become the conventional education reform wisdom within both Republican and Democratic elite policy circles — despite a clear absence of evidence that it actually works for kids. "If we really wanted to improve schools," analyst Melinda Henneberger quipped in The Washington Post, "we'd do what education powerhouse Finland does — fund schools equally, value teachers more, and administer standardized testing almost never." America's affluent don't want to hear that. In cocktail party circles, as The New Yorker recently noted, "a certain casual demonization of teachers has become sufficiently culturally prevalent that it passes for uncontroversial." The well-heeled talk about breaking teacher unions "with the same kind of social enthusiasm" they usually reserve for recommending "a new Zumba class." This teacher bashing has been spreading for several decades now, ever since American inequality started to take off back in the 1980s. No surprise here. These two trends — a rich growing richer and a rich growing more hostile to public services and the people who provide them — have always gone hand in hand. Wealthy people, after all, don't typically rely on public services. They belong to private country clubs, send their kids to private schools, and royally resent having to pay taxes to support public services they don't use. These well-to-do need rationalizations for this resentment. Bashing teachers gives them one. We don't need to "throw money" at troubled schools, the affluent contend. We just have to find and fire all those lousy teachers. Interestingly, back in the much more equal United States of the 1950s, we did "throw money" at schools — and plenty of it. In 1958, after the shock of the Soviet Sputnik launch, lawmakers didn't bash teachers. They appropriated billions, through the National Defense Education Act, to strengthen science education. A half-dozen years later, the Elementary and Secondary Education Act vastly expanded funding for low-income students. "Blaming teachers for the failure of schools," as The New Yorker's Rebecca Mead puts it, may be as absurd as "blaming doctors for the diseases they are seeking to treat." But bashing educators makes sense to the rich. And in a plutocracy, the rich drive the debate — until the rest of us rise up and change the conversation. In Chicago, teachers have now done just that.